Diabetes is one of the top ten leading causes of death in our country according to the Centers for Disease Control and Prevention, and Forsyth County is no exception. If left unmanaged, diabetes can cause blindness, kidney disease and circulation problems that can lead to loss of limbs and other health issues. African Americans are more than twice as likely as Caucasians to develop diabetes. 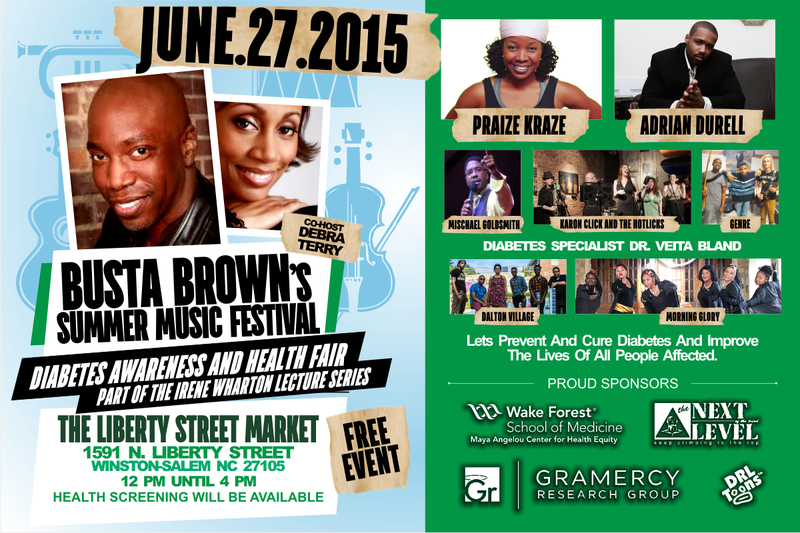 This year, Busta Brown’s Summer Music Festival will focus on diabetes awareness and host a health fair. Bell points to research findings that indicate that Type 2 diabetes can be prevented through healthy lifestyles that include weight maintenance, exercise, eating healthy foods, and making these efforts a family affair. 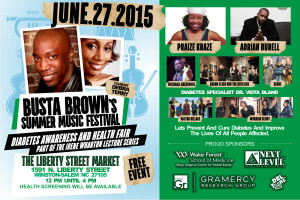 Busta Brown’s Summer Music Festival Diabetes Awareness and Health Fair will be held on June 27 from Noon to 4 p.m. at the Liberty Street Market located at 591 N. Liberty Street in Winston-Salem. Festival music artists include Adrian Durell, Michael Goldsmith, Karon Click and the Hotlicks, Genre, Dalton Village and Morning Glory. Attendees can also participate in a fitness dance led by Praize Craze and health screenings for diabetes. The festival is sponsored by Next Level Productions, Gramercy Research Group, DRL Toons and the Maya Angelou Center for Health Equity. The event is part of the Irene Wharton Lecture Series supported by funds from the Wharton Gladden. The lecture series is named after Ms. Irene Wharton, a former resident of east Winston-Salem who died from complications of diabetes. The event is free and will be co-hosted by local media personalities Busta Brown and Debra Terry.